Yogurt has been part of the diet in southeastern Europe and the Middle East for millennia and is now part of the dairy counters even in the smallest grocery stores in many countries. It is a cultured milk product easy to make, so there are many other websites with advice on how to proceed. The most important part is to heat the milk at 85 to 95°C for 5 to 10 minutes. Lactic acid bacteria are essential to making yogurt from milk. Compared to other milk products such as cheese, ice cream, or butter, yogurt contains most milk constituents except lactose, which the bacteria convert into lactic acid. This acid gives the yogurt a pleasant acidic flavour and, at the same time, the sweetness caused by lactose is reduced. Live 'friendly' lactic acid bacteria protect the yogurt from harmful pathogenic microorganisms and thus give it a longer shelf life. The fat content in some yogurts may be reduced for dietetic reasons. Some yogurts may contain so-called thickening agents, such as various plant polysaccharides (gums), gelatinized starch or gelatin. Their role is to firmly hold water in the body of the yogurt. Yogurt has traditionally been made from milk that had been partially condensed by evaporation while it had been heated almost to boiling. Coagulation of the milk proteins is induced by thermophilic bacteria, such as Lactobacillus delbrueckii subsp. bulgaricus and Streptococcus salivarius subsp. thermophilus, i.e., bacteria which propagate well at an elevated temperature of 40° to 45°C. More recently, Lactococcus lactis is used together with L. bulgaricus, with which it is synergistic, which means that each produces metabolites required for the growth of the other. However, some lactococci produce bacteriocins called lactococcins which kill other lactococci and are incompatible for use in mixtures. The milk is coagulated by a slowly increasing concentration of lactic acid as the bacteria metabolize lactose. The proteins do not precipitate (as would happen following an addition of a large amount of lactic acid) but form a gel. Its ability to retain all the water present in the milk is the result of a peculiar microstructure of the protein network. 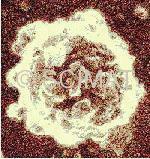 It consists of short branched chains of casein micelles and resembles a sponge with very small pores. Yogurt is unique from both the structural as well as compositional viewpoints, because it is solid and has the highest water content of all solid milk products. Yogurt that has been stored for a long period of time may show some syneresis as the separation of a liquid phase from a gel is called. This is only a minor cosmetic defect and the liquid soaks back into the body of the yogurt as soon as the yogurt is stirred. Electron microscopy reveals interesting features in the development of yogurt structure. The crucial condition in yogurt making is the heating of the milk. Its temperature must reach at least 85°C (90°C is more commonly used) and held at this temperature for at least 10 min. This treatment alters the casein micelles and prepares them for the unique structure to form. 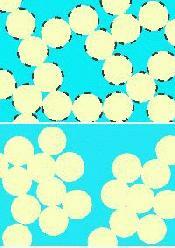 Casein micelles are described as protein globules about 100 nm in diameter, which consist of yet smaller submicelles. Of several different casein molecules, kappa-casein (κ-casein) on the surface of the micelles has a pivotal role in their stability. As long as this protein is intact, the micelles stay in milk as individual entities. Any change in the integrity of κ-casein destabilizes the micelles and they aggregate. Casein micelles in unheated milk have relatively smooth surfaces with very small humps caused by the submicelles. 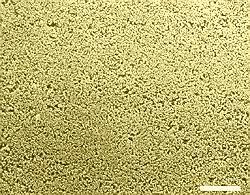 Heating above 85°C leads to an interaction between β-lactoglobulin (one of the whey proteins) and κ-casein on the casein micelle surface. The result is a complex which makes the casein micelle surface markedly coarser (figure at upper left). Casein micelles with the κ-casein–β-lactoglobulin complex formed on their surfaces have a limited ability to aggregate (figure at left). Consequently, short branched micelle chains are formed (upper diagram at right). In cheese manufacture, where κ-casein disintegrates under the effect of a proteolytic enzyme called rennet, the micelles aggregate into large clusters (lower diagram at right). Whey protein concentrate which forms very fine dispersions and does not contain casein micelles, forms bridges between the casein particles in yogurt. Transmission electron microscopy (TEM) is better suited to show the fine bridges. The image at left is a TEM micrograph of regular yogurt made from unfortified milk in which the protein network consists of casein particles. The micrograph at right was obtained with a yogurt made from skim milk fortified with 1.5% of an ultrafiltered whey protein concentrate. These experiments have been published by H. W. Modler and M. Kaláb. Separation of the liquid phase in gels is called syneresis. In yogurt, it is undesirable and it occurs when the protein network is unable to firmly retain water. There are several reasons why syneresis may develop. One of them is insufficient preheating of the milk destined for yogurt production which means that casein micelle clusters are formed in addition to branched chains and the clusters do not hold as much water as the porous structure based on chains. The total solids content also has a great effect on the ability of yogurt to hold water. 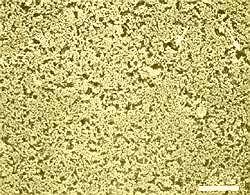 This is evident from the micrographs above which show the structures of yogurt samples made with 10, 15, and 20% total solids. The higher the total solids content, the denser the protein network, the smaller the pores, and the stronger the water-holding force of the yogurt. Traditionally, milk used for yogurt making was evaporated by heating but nowadays the total solids content is controlled by the addition of milk solids such as milk powder or by concentrating the milk by ultrafiltration or reverse osmosis. The acidity (expressed as pH which indicates the concentration of hydrogen ions) of the yogurt also plays an important role. Most yogurts have their pH value in the range of 4.0 to 4.4. The presence of thickening agents such as gelatinized starch, gelatin, or various plant-based agents such as carrageenan or locust bean gums reduces syneresis but may impart sensory properties which are not welcome by some consumers whereas others may like them (e.g., increased viscosity). Vibrations, to which goods are exposed during transportation, also increase susceptibility of set-style yogurt to syneresis. Susceptibility to syneresis can be measured in laboratory conditions using a drainage method suggested as early as 1959 by D. B. Emmons et al. (Journal of Dairy Science Vol. 42, pp. 866-869). The method is based on making yogurt in 250-mL beakers, cutting it into 4 parts, and transferring the contents onto a stainless 120-mesh screen. The volume of the whey separated is measured at 5 min. intervals for 60 min. During their studies of milk gel structure, V. R. Harwalkar and M. Kaláb designed a centrifugation method (Scanning Electron Microscopy 1981:III, 503-513) which was later applied to yogurt (Milchwissenschaft Vol. 38, No. 8, pp. 517-522, 1983). The relationship between microstructure and susceptibility to syneresis was explained there. Yogurt is made in 15-mL centrifugation test tubes. The test tubes are then subjected to centrifugation for 10 min at forces ranging from 30 to 2000 xg. The volume of the separated whey is measured and plotted against the centrifugal force applied. 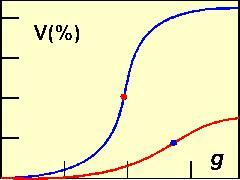 The g-force of the inflection point on the resulting S-shaped curve has been used as an arbitrary measure of susceptibility to syneresis. Two yogurts are shown in the diagram at left, where 'V' is the volume (in % at steps of 0, 10, 20, 30, and 40%) of the whey collected from each individual sample and g is the centrifugation force at steps of 500, 1000, and 1500 xg). The blue curve was obtained with yogurt containg 10% total solids. At the maximum centrifugation force, the whey released was a little over 40% of the total volume of the yogurt. The red curve was obtained with a yogurt fortified with skim milk powder to 15% total solids. The inflection point occurred at a higher g-force and the volume of the whey released was markedly lower than in the former yogurt. An electron microscopy study of yogurt samples subjected to centrifugation and comparison with the drainage test suggested that lowering pH increased the rigidity of the protein network thus reducing susceptibility to deformation. Thus, at least two factors control syneresis - density of the network and resistance of the protein chains to deformation. Labneh is strained yogurt popular in the Middle East. Unlike yogurt, it is made from whole milk. Apart from cow's milk, sheep's and goat's milks are used in countries such as Lebanon, Syria, and Turkey, where the climatic conditions are not favourable for cows to keep. In the United Kingdom, labneh is marketed under the name of Greek cheese and in North America it is often called yogurt cheese. In Arab countries, labneh is garnished with dried herbs and olive oil and is served with bread. 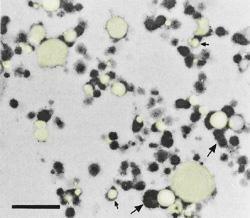 Transmission electron microscopy of sheep's milk labneh: Fat particles (yellow - small arrows) are encapsulated in aggregated protein particles (dark structures - large arrows). Bar: 1 µm. Scanning electron microscopy of nonhomogenized goat's milk labneh (left) made by the traditional procedure and nonhomogenized labneh made by the ultrafiltration of cow's milk yogurt (right). Protein is light, pores are dark. The labneh protein matrices were denser than those of commercial yogurt shown higher up on this page. Bars: 25 µm. The traditional method of producing labneh consists of straining whole-milk yogurt in a cheese cloth bag. Modern procedures are now increasingly used to make labneh. Excess liquid from traditional yogurt can be removed in mechanical separators. Changes to the traditional production of the yogurt have also been introduced, e.g., retentates obtained by the ultrafiltration (UF) of milk are cultured to produce a yogurt with a higher solids content, thus avoiding the need for concentrating it. In another procedure, warm yogurt may be ultrafiltered, as suggested by Adnan Y. Tamime, the coauthor of several scientific papers on labneh and a book on yogurt. Protein matrices in labneh made by straining yogurt (traditional method) and in labneh obtained by ultrafiltration of warm yogurt were examined by electron microscopy. The labneh samples were made from cow's and also goat's and sheep's milks. The total solids contents of labneh were between 20.5 and 22.5%, protein was 6.7-8.2% and fat was 7.8-8.9%. Homogenization, which was used to make the product smoother, cannot be recommended because it would decrease the firmness of labneh (cow's milk product was less affected than the other two labnehs, where the pore sizes were found by microscopy to be larger). Homogenization (single-stage ALM homogenizer at 7°C and a pressure of 8 MPa) resulted in the disintegration of the fat globules and association of their fragments with milk proteins, which could be observed only by transmission electron microscopy (TEM) (figure at left). There were differences in the microstructures of labnehs made from nonhomogenized yogurts depending on the milk and the method of concentration used. A. Y. Tamime and R. K. Robinson: Yogurt - Science and Technology, 3nd edition. Tamime AY, Kaláb M, Davies G: Microstructure of set-style yoghurt manufactured from cow's milk fortified by different methods. Food Microstructure 3:83-92 (1984). Tamime AY, Kaláb M, Davies G: Rheology and microstructure of strained yoghurt (Labneh) made from cow's milk by three different methods. Food Microstructure 8:125-135 (1989). Tamime AY, Davies G, Chehade AS, Mahdi HA: The production of Labneh by ultrafiltration - a new technology. J. Soc. Dairy Technol. 42:35-39 (1989). Tamime AY, Kaláb M, Davies G, Mahdi HA: Microstructure and firmness of labneh (high solids yoghurt) made from cow's, goat's and sheep's milks by a traditional method or by ultrafiltration. Food Structure 10:37-44 (1991).